ASSETS client and participant in the 2015 Great Social Enterprise Pitch, The Stroopie Co., is making news! If you’ve ever heard of Lancaster County, Pennsylvania, you’re probably aware that it’s home to one of the biggest populations of Anabaptist religious sects, such as the Amish and Mennonites, in the United States. You may not know that it sits near the heart of Pennsylvania’s enormous sweets industry, just next door to the candy-making mecca of Hershey; and that the county accepts hundreds of refugee immigrants every year. The Stroopie Co., a small Lancaster company that manufactures Dutch-style cookies, has a mission to hire and train refugee women as its workforce. The company’s hiring practices reflect its community’s history and spirit. “We were looking for a really practical way to love our neighbor well,” says Jennie Groff, who co-owns “Stroopie” with her husband, Jonathan. She worships in an Anabaptist church that focuses on supporting refugees. “The company fits my roots,” she says. Stroopie’s was started in 2008 by Ed McManness and Dan Perryman, who remain part-owners. The goal was always to provide “meaningful employment” to local refugees; McManness’s family had enjoyed Dutch “stroopwafels” — a cinnamon cookie made in a waffle iron with a layer of caramel inside. The circular cookies rest perfectly on the lip of a mug of steaming hot tea or coffee, which softens the caramel filling. 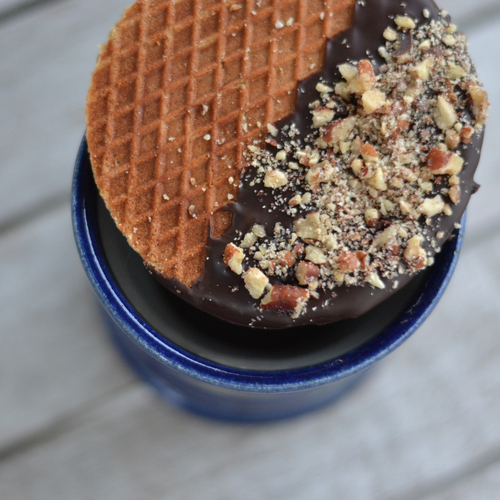 The Stroopie Co. makes one version half-dipped in chocolate. The Groffs joined the enterprise in 2010, bringing with them Jonathan Groff’s lifetime of experience in his family’s candy-making business. Today, Stroopie’s employs six refugee women — three from Myanmar and three from Syria. Another employee manages the staff and acts as an ESL teacher. Employees typically stay a year or two before moving on, Groff says. Workers start out making $11 an hour, Groff says, then move up to $12 an hour after training. The owners want to eventually pay a wage of $15 an hour, and perhaps even start giving the women part ownership of the company. Getting to that point, however, requires that Stroopie’s take a big next step. In 2015 Stroopie’s won “The Great Social Enterprise Pitch,” a local competition meant to encourage businesses that “perform a social good while also making a profit.” The prize: In-kind products and services worth more than $25,000, meant to help the company grow. Stroopie’s used its winnings — along with money raised from Indiegogo as part of the competition — to open a retail storefront in Lancaster, where the cookies are made and sold directly to the public. The company also distributes its product in nearly 70 stores across the United States and is pitching bigger retailers. Groff says she is confident the company will continue to grow, increasing profits and employing more refugees. “Both have to be equally strong — you have to have passion for both things — or it’s not going to be sustainable, it’s not going to work,” Groff says.